I forgot to add something else about my magic eyelids. Whether I move my body or not, as soon as I open them, it triggers the dogs to run in to get me up and the puppies to begin clamoring for breakfast. I'm sure the very last thing you want to hear about is yet another report on How My Night Went. Nothing more boring than hearing about whether someone else slept or not through the night. Well, then I guess you'll have to go elsewhere, 'cause that's on my agenda for today. I'm realizing that I will have to take a nap today because I'm reviewing a show tonight that is going to require my paying close attention and I'm operating on very little sleep at the moment. So let me see how last night went. First of all, I've been putting off watching all the episodes of Traveler that I'd recorded and I made the mistake of starting to watch "just one or two episodes" and ended up watching the entire season. It's kind of the new 24, I think, but without a Jack Bauer-like character. I finished the final episode at some time after midnight and when I lowered the footrest of my recliner in preparation to get a drink of water, Sheila, who had been keeping watch on the patio, raced in the dog door and Lizzie, who had been sleeping on the dog bed, started leaping at me. "Let's go to sleep. NOW!" The puppies were stirring and I knew they didn't need to eat, but would demand to eat if they saw me, so I snuck out of the family room and bypassed the bathroom because I felt that if the puppies heard me I'd be up another hour what with feeding and playing and cleaning up after puppies. I quietly climbed onto the couch and Sheila and Lizzie, who had been peacefully sleeping beforehand, decided it was PLAYTIME! Lizzie chased a flattened water bottle under the couch and was determined to eat through the couch to find it. I got up and got it for her. Sheila decided to dig a hole in the carpet to bury it. I yelled at her. They chased each other down the hall and the puppies started stirring. I called them back. They wrestled on, over and underneath me. I finally told them to settle down and, miraculously, they did. By then I had been trying to get to sleep for about half an hour and my bladder had just remembered that I had bypassed the bathroom because of not wanting to wake the puppies. It would be unwise, I determined, after trying very hard to ignore the obvious, to try to get to sleep without making that trip to the bathroom. Naturally, the act of my getting up got the older dogs all turned on again and we had a repeat of half an hour before. The dogs finally settled down and restless leg set in. I could not get comfortable or settle down myself to save my soul. I tried all sorts of positions (or as many as you can get to on a couch) but none worked. I knew what I needed. I needed the recliner. But I didn't want to get the dogs all riled up again. Still, it seemed the only solution. When I disturb Sheila in the middle of the night, she goes outside and sits for awhile and then starts barking. She knows that I'll bring her back inside again and we play the game "come -- no I won't come - come - you can't make me" game, so I figured I'd quickly lock her in the house, but she was too quick for me and as I started for the kitchen, she was already outside, with Lizzie in hot pursuit. F**k it, I thought. Sleeping in the recliner was now out because I knew that as soon as I settled in, Sheila would bark. So I just slunk back into the living room and onto the couch, which is where Sheila wanted me. Sheila, realizing that I was no longer in the family room, came docilly into the living room and laid down at my side. Lizzie jumped up into her chair and peace reigned. Any way, dogs be damned, I had to go to the recliner. I tried not to let Sheila hear me thinking (she can, you know). I got up and, miraculously, she didn't figure out what I was doing until I had the door blocked. I climbed into the recliner, Lizzie and Sheila gave up and went back to the living room...and that's when the puppies woke up. I let them whine and bark for awhile, turned on a PBS special on the Mormons (which I figured was a sure-fire soporific) and, finally, I fell asleep. I managed to sleep a whole 3 hours and woke up as the first light of sun began to peek in the window. I was awake before the dogs knew I was awake, but it wasn't until my magic eyeballs finally opened that the two big dogs burst out of the living room and all three puppies began to clamor for food. I hadn't so much as moved a big toe. All I did was open my eyes. It's hell having magic eyelids, I tell ya. 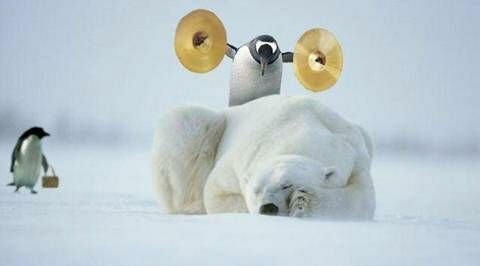 OK--so I was wrong about polar bear naps!